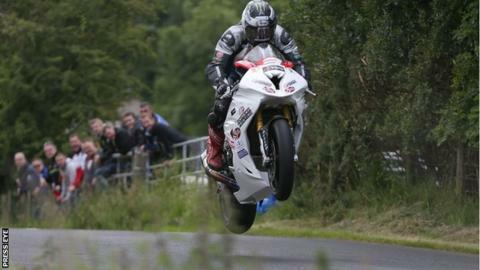 Michael Dunlop won the feature 'Race of Legends' event for the fifth year in a row at the Armoy road races. BMW mounted Dunlop came home 2.4 seconds ahead of Guy Martin, with Yorkshireman Dean Harrison third. William Dunlop was a double Supersport 600cc winner at the meeting, while Martin took victory in the Open race. The racing was marred by a serious accident during the Supersport 400cc race, with a rider airlifted to Belfast by an Irish Coastguard helicopter. William Dunlop began the event in style, triumphing with 3.4 seconds to spare over Guy Martin in the opening 600 race held on Friday night, with Harrison occupying the final podium spot. Dunlop made it a double in the class by winning Saturday's race which was reduced to six laps after twice being halted because of red flag incidents. The CD Racing Yamaha rider, who turned 30 last week, again got the better of Martin and Harrison to take his career tally of successes over the three-mile course to nine. Martin won the Open race for the second year in a row, seeing off nearest challenger and Tyco BMW team-mate William Dunlop by a margin of 2.3 seconds. Dubliner Derek Sheils was third on his Bike Bits NI Kawasaki, Michael Dunlop fourth on the BMW and Harrison fifth. Ryan Farquhar won the Supertwins outing by one second from Mullingar's Derek McGee, with former double British 125cc champion Christian Elkin third. Ballymena's Sam Wilson headed off a strong challenge from Michael Dunlop to take the 250cc honours, with Paul Robinson third. Meanwhile Paul Jordan from Magherafelt took the chequered flag in the 125cc category, ahead of Wilson and Nigel Moore. Czech rider Michal Dokoupil was the Supersport 400cc victor, ahead of Ballymoney man Seamus Elliott.